As I've mentioned previously, a special movie interest of mine are Asian films that are contrary to the kinds that usually receive a mainstream theatrical release in the U.S. Rather than period or martial arts films, my tastes run not to just the kind of action films that John Woo originally made popular here, but also art-house films and screwball romantic comedies. As I've said, I particularly appreciate the glimpse these movies give into the lifestyles of modern Asia's urban young (and stylish) twenty-somethings. A movie that definitely falls into this category that I rented thru Netflix is Beijing Rocks (2001). The film follows three young wannabe rockers: the lead singer of a garage band who seeks a contract and to be taken seriously as an artist; his girlfriend; and a semi-successful pop artist from Hong Kong who hits the road with the band to overcome writer's block. This movie definitely has higher ambitions compared to some of the more fluffier, pop Asian fare I have developed a soft spot for, and it succeeds. Beijing Rocks trades on the same sense of disaffection that have characterized youth films and youth culture dating back to Rebel Without a Cause. A love triangle, of course, develops, and though it gives the movie some emotional scope, it doesn't cheapen the movie by becoming a major point of conflict in the film (aside from perhaps emotionally). In fact, the film is bittersweet and tragic, and to its credit does not go for the easy "feel good" audience-pleasing ending, though the film very easily could have gone there. Beijing Rocks also definitely provides a fascinating peak into a China I'm sure most people would be surprised to know exists, consisting of garage bands, glam rock clubs, and mosh pits. And look out for the montage sequence featuring a rock version of the Communist anthem, "The Internationale"! 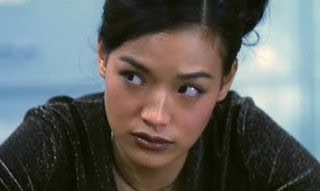 Full disclosure: I admit that one reason I rented this film was for actress/Asian pinup girl Shu Qi, for whom I also have a soft spot. She's appeared in her share of throwaway Asian formulaic films (some personal favorites include So Close, Gorgeous with Jackie Chan, and Love Me, Love My Money), and she crossed into mainstream Hollywood with the modest hit The Transporter. But along with another art-house film of hers that I viewed and was impressed by awhile back (The Foliage), a restrained romantic drama set during China's cultural revolution! ), and the recently released art-house film Three Stories, she demonstrates that she is a serious, ambitious actress who possesses some real acting chops.